Does that sound familiar? Do you know what they’ve got in common? Maybe they’re all made out of quality Slovenian sheep wool. That’s right, sheep are not only cute white animals grazing on pastures from when first strong sun rays melt the snow, until the autumn when the cold sets in. They are also the source of a soft pillow and warm blanket. Twice a year, usually in spring and autumn, when the weather is warm enough we sheer them. Did you know, it’s possible to get 2 kilos of wool per sheep? 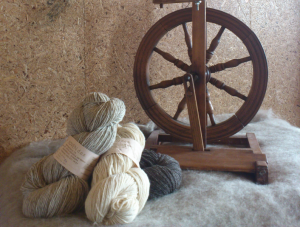 The sheered wool is first cleansed of rough materials and impurities. Next it’s washed and combed – or as the people doing it say: mikana. And then the wool can be transformed into objects that we need. In Selnica ob Dravi (13 kilometers from Maribor in the direction of Dravograd) you are welcome to visit one of the few sheep wool producers of Slovenia – the weaving house SOVEN. They will demonstrate to you, how wool is being prepared for processing, how it’s woven and how they make both handmade or machine knitted products and especially, how bed linen is made. Company Soven from Selnica ob Dravi offers Slovenian wool made completely ecologically. They tend to make as many different useful and original wool based products, by which they also help Slovenian sheep-farmers to gain added value for their wool. In the production hangar you’ll see how blankets are made, all sorts of linen, pillows, decorative details, woollen fabrics, rugs and carpets, horse blankets, BIO fabrics, unique knitting, socks, stockings, glows, hats, scarves, pullovers, ponchos, jackets and bed covers. Wool has been used for clothing for millennia. 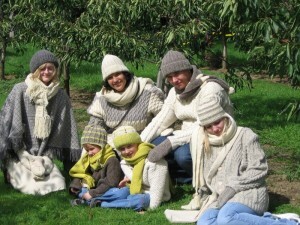 Today the unique wool products have fashion designs and above all warm and natural. But it’s not only people who use wool to keep themselves warm, they also put it in the Bio woollen house isolations. The Soven products are ecologically made. Most are also handmade and have the touch of being *unique,* and they are made with a lot of tradition – such products have the Slovenian *art/craft* certificate. Dear travellers, if you’re travelling through Slovenia, you are more than welcome to stop within the Drava valley and take a look at the unique was of wool production. We especially recommend our tour to schools and groups of interested visitors, so you can see one of the few wool weaving productions in Slovenia, located in the Drava valley. You are welcome to visit each work day between 9am and 4pm and between 9am and noon on Saturdays. After the production hall you’ll get to see the shop and the exhibition salon, where you can buy the unique products at very affordable prices. If you’re a Hostelling International member, you can get a 15% discount for the admission price to see one of the few sheep-wool weaving productions in Slovenia.